The Borealis Alliance Free Route Airspace programme has been awarded a coveted prize by the European Commission for its contribution to delivering the Single European Sky. 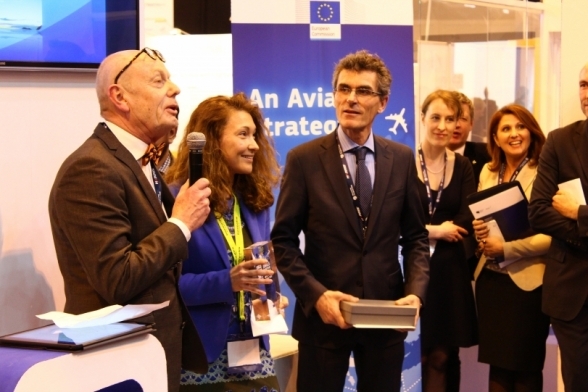 The programme, which will see a single flight-plannable area of Free Route Airspace covering nine North European countries by 2021, was one of a select number of projects recognised by the Commission in its inaugural Single European Sky awards. The awards have been established to recognise programmes that are making a significant contribution to making air travel in Europe greener, cheaper and more efficient. EU Commissioner for Transport Violeta Bulc said: “The fragmentation of the European sky is costing us €5 billion a year and millions of tonnes of unnecessary CO2. Completing and implementing the Single European Sky is therefore an absolute priority of my mandate, and we gave it a new push with the Aviation Strategy we adopted last December. But to succeed, we need to get all stakeholders on-board. Branka Subotic, Executive Director of the Borealis Alliance and Olle Sundin, LFV Chief Executive and Chair of the Borealis Alliance Board, accepted the award from Maurizio Castelletti, Head of the Single European Sky Unit in the Commission’s Transport and Mobility Directorate at a ceremony during the World ATM Congress in Madrid. Branka Subotić, Executive Director of the Alliance, added: “This award is recognition of all the hard that work that the nine ANSPs have put into this initiative. We have a long way still to go but have made a great start and look forward to working with our customers, regulators and others to make sure that the Borealis Free Route Airspace programme delivers and makes flying in Europe cheaper, safer and greener for our customers”. The Borealis Free Route Airspace programme is a voluntary collaboration between Air Navigation Service Providers from three Functional Airspace Blocks (FABs), plus Iceland. It will enable airspace users to plan and take the most cost effective, fuel efficient and timely routes across the entire airspace managed by Borealis members rather than following pre-defined ‘routes’ within each member country’s airspace, saving time, money and fuel. The programme will build on work initiated through the three existing Functional Airspace Blocks (FABs) – the Danish-Swedish, UK-Ireland and North European FABs – and the North European Free Route Airspace (NEFRA) programme, but is voluntarily being expanded by the ANSPs to maximise the benefits for customers. Overall, it was a great night for Borealis Alliance members, with four of the five awards going to projects involving either some or all of the Borealis members. As well as the award for the Borealis Free Route Airspace programme, the IAA, LFV and Naviair won an award for their involvement in COOPANS, a leading industrial ATM system collaboration, which is reducing costs and harmonising system development between members; LFV won the award for their world-first remote tower deployment; and NATS won for their deployment of Time-Based Separation at Heathrow airport, also a world-first. Featured image caption: Olle Sundin, Chair of the Borealis Alliance Board and Branka Subotić, Executive Director of the Borealis Alliance accepting the SES award for the Borealis Alliance Free Route Airspace programme.